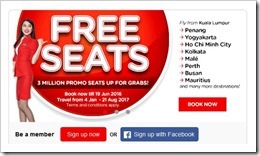 Currently, AirAsia is running a Free Seats promotion on all their flight destination. There are maximum up to three million promotional seats to be grab! The booking start today until 19 June 2016 and the travel period is from 4 January 2017 – 21 August 2017. The Free Seats promotion destination include their entire short- and long-haul network. The long-haul network was served by AirAsia X.
I managed to grab a free seat return flight ticket to Yogyakarta, Indonesia for only RM73. It’s cheaper than the taxi fare to klia2 airport! The Zero free seat fare means the base fare of RM0. So it’s NOT Free as You still have to pay for the taxes and other fees. AirAsia and AirAsia X, the low-cost carrier, fly to more than 120 destinations in 24 countries. They have make everyone to fly at a low cost. Do read their Terms and Conditions before purchasing any of the seat offered. – FREE SEATS booking period: 13 June 2016 – 19 June 2016. • A non-refundable processing fee is applicable for payments via credit, debit or charge card. • Fare includes airport taxes (except for selected airports where airport tax is collected at the point of departure). • Changes to name are not permitted • Only available for online bookings at www.airasia.com. a. Bonus AirAsia BIG Points will only be awarded if valid BIG Shot ID is inserted at time of flight booking. b. Retro claim of AirAsia BIG Points is not applicable. c. Only bookings made on www.airasia.com are eligible to bonus AirAsia BIG Points. d. AirAsia BIG Points will be awarded 4 weeks after promotion ends. This entry was posted on Monday, June 13th, 2016 at 3:22 pm	and is filed under Travel. You can follow any responses to this entry through the RSS 2.0 feed. Both comments and pings are currently closed.